Purposefully written for those coming to politics for the first time, this textbook provides an exploration and analysis of the most important political issues affecting the Developing World. Offering a different perspective from standard texts in this field, Politics in the Developing World encourages an understanding of the breadth and nature of a range of pressing - and previously understated - issues: the striving for democracy; the political consequences of economic growth and development; the struggle of religious and ethnic minorities; women's and human rights; the impact of globalization; and the politics of the natural environment. Purposefully written for those coming to politics for the first time, this textbook provides an exploration and analysis of the most important political issues in the Developing World. Offering a different perspective from standard texts in this field, Politics in the Developing World encourages an understanding of the breadth and nature of a range of pressing - and previously understated - issues. This new edition of the text (previously titled Third World Politics: A Concise Introduction) has been completely rewritten, taking into account changes in the Developing World in the last decade. An increased focus on the international relations of the Developing World to complement those chapters concerned with domestic issues and with updated regional analyses and data throughout. Professor Jeff Haynes is in the Department of Politics and Modern History, London Guildhall University. He is the author of Religion in Third World Politics (1993), Religion and Politics in Africa (1996), Third World Politics (Blackwell 1996), Democracy and Civil Society in the Third World: Politics and New Political Movements (Polity, 1997), Religion in Global Politics (1998), Democracy in the Developing World: Africa, Asia, Latin America and the Middle East (Polity, 2001) and the editor of Religion, Globalization and Political Culture in the Third World (1999), Democracy and Political Change in the 'Third World'(2001) and Towards Sustainable Democracy in the Third World (2001). He is also the author of numerous book chapters, articles and conference papers on various aspects of the Developing World and comparative politics. 1. Politics, Economics And Societies In The Developing World At The New Millennium:. What’s In A Name: “Developing World”, “Third World”, Or “The South”?. Domestic And External Factors In Explaining Outcomes In Developing Countries. The Analytical Importance Of Structure And Contingency. 2. Globalization And International Relations:. The Impact Of Technological, Economic, Political, And Cultural Globalization. 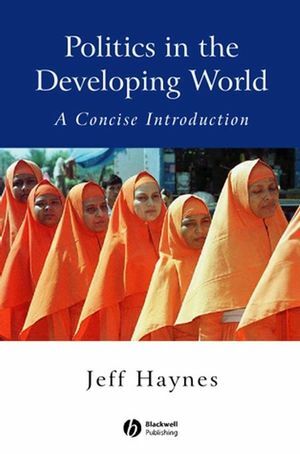 The International Relations Of The Developing World. Conclusion: Globalization, Regionalization And The Developing World. 3. Economic Growth And Development:. Development And Inequality At The Start Of The Twenty-First Century. Economic Polarization In The Developing World: The 1980s And 1990s. Economic Reform In Developing Countries. The Third Wave Of Democracy In The Developing World. Democracy In The Developing World: The Regional Picture. Accounting For Democracy: The Comparative Importance Of Domestic And External Factors. Case Studies: South Africa And Indonesia. 5. Religious And Ethnic Conflict:. The Political Salience Of Religion In The Developing World: Domestic And International Factors. Regional Analysis: Religio-Ethnic Conflict In The Developing World. Human Rights In The Developing World: Domestic And External Factors. Collectivist And Individualist Conceptions Of Human Rights. Regional Analysis: Political Rights, Civil Liberties, And Human Development In The Developing World. Gender Discrimination And Poverty In The Developing World. Women’s Empowerment: “Feminist” And “Feminine” Groups. The Socio-Economic Position Of Females In The Developing World. The Impact Of Structural Adjustment And Globalization On Poor Females. Regional Analysis: A Woman’s Place. 8. Politics Of The Natural Environment:. From Stockholm To Kyoto: 25 Years Of Growing International Environmental Awareness. Environmental Crisis In The Developing World. Environmental Concerns And Politics In The Developing World: The Domestic Dimension. The External Dimension Of Environmental Protection: The IMF, The World Bank And Greenpeace International. Case Studies: Environmental Groups In The Developing World. Domestic Factors: Political Participation, Civil Society And Economic Development. Appendix 2: Freedom House Survey Methodology.